Summary: In this webinar, Bronwyn will show us how to use numerous applications to assist with teaching additional languages. 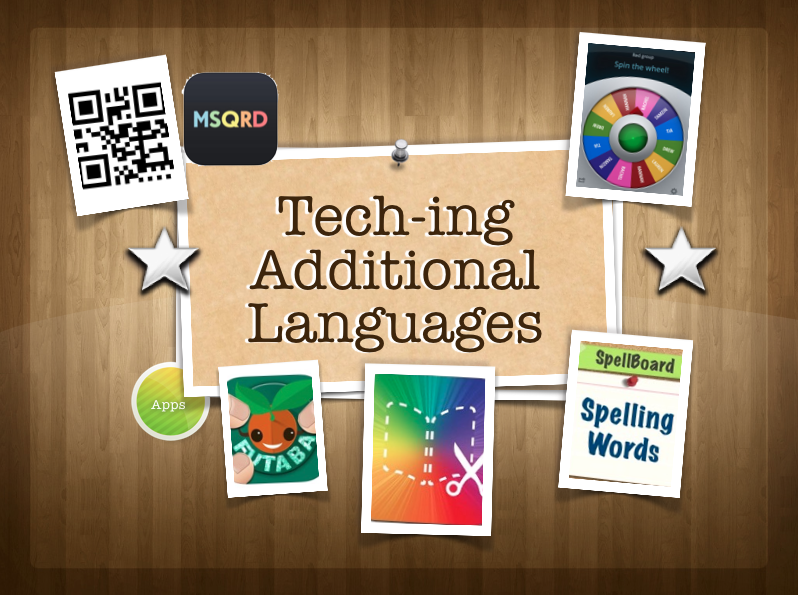 These will include Book Creator, Futaba, Spell Board, QR Codes and others. She will draw from her years of experience as an EFAL and French Additional Language teacher to provide time-saving examples of how to effectively integrate technology into teaching additional languages. These tips help make language learning personal, exciting and effective. Presenter: Bronwyn Desjardins is an iTeacher (2012) winner, MIE runner-up (2010) and Apple Distinguished Educator who has presented at numerous IT conferences. She has 18 years of teaching experience including teaching oversees as an EFL/ESL teacher. 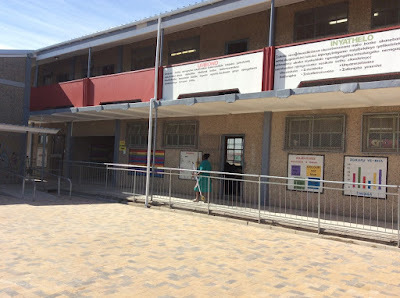 Free State’s Summerville Primary School is situated in Welkom and is part of the Telkom Foundation’s Connected Schools Program. Our spotlight for this month is on Mr Setshaba Mobe who is an Economic and Management Sciences educator for Grade 9 learners at the school. The Free State Department of Education official, Mr Tyran Ferndale, nominated Setshaba as a shining star due to his perseverance in making time to plan, prepare and implement in the classroom what he learns on a daily basis. 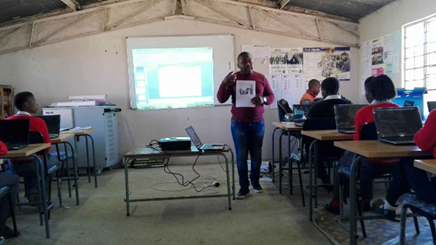 “He is always keen to teach and learn from his colleagues," says Tyrone Ferndale..
Setshaba is looking forward to participating in the next training session where he will have opportunities to share some of his lessons with other teachers. He reiterates that there are other teacher colleagues can also develop great lessons if they try. He would like each teacher to share a lesson so that collectively they can work on making more meaningful lessons for their learners. After looking through all the Google posts that were shared to various subscriptions recently, these are a selection that look useful for teachers. 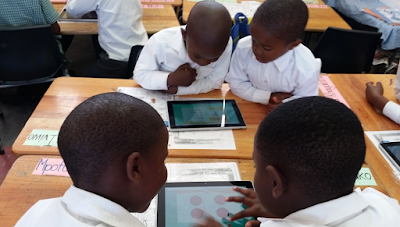 Tablets are revolutionary devices that hold great potential for transforming learning. In the hands of skilled teachers and interested learners, tablets can be used to create some fantastic learning opportunities. 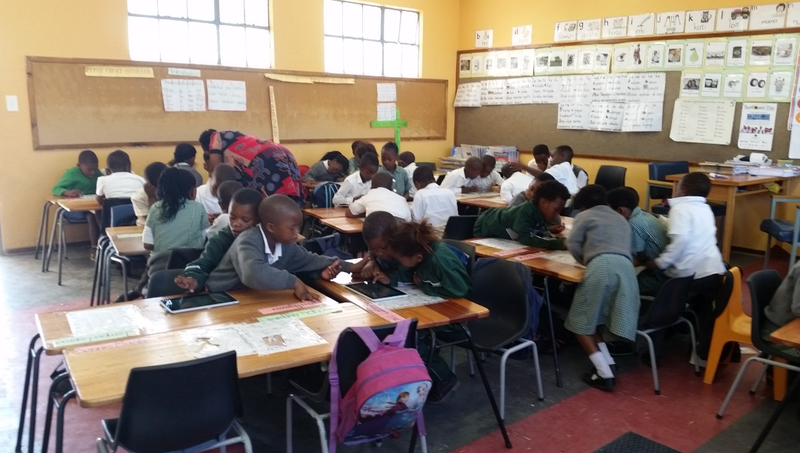 Recently Microsoft and the Western Cape Education Department delivered 99 Windows 10 tablets, in three cabinets, to 42 Western Cape Schools that would otherwise never be able to afford such devices. Selected Grade 1,2 and 3 teachers from each school, along with teachers from other schools in the vicinity, were provided with a day’s training presented by SchoolNet facilitators. These teachers shared what they had learned with the rest of their staff when they returned to their schools; and then, a few weeks later, each school was visited by a SchoolNet facilitator to see how the teachers and classes were managing with the tablets.Mostly, no Internet is available in the classrooms at these schools, so the teachers have to use offline apps in their lessons. The Windows 10 tablet is well-suited to offline use as it is very similar to using a Windows 10 computer offline. I was privileged to visit IkhweziLesizwe Primary School situated in Khayelitsha, one of the poorest areas of Cape Town, as part of this visitation programme. The minute that I stepped out of my car I knew I was in a happy school environment. People greeted me and smiled and I could hear the happy buzz of children learning in the classroom. 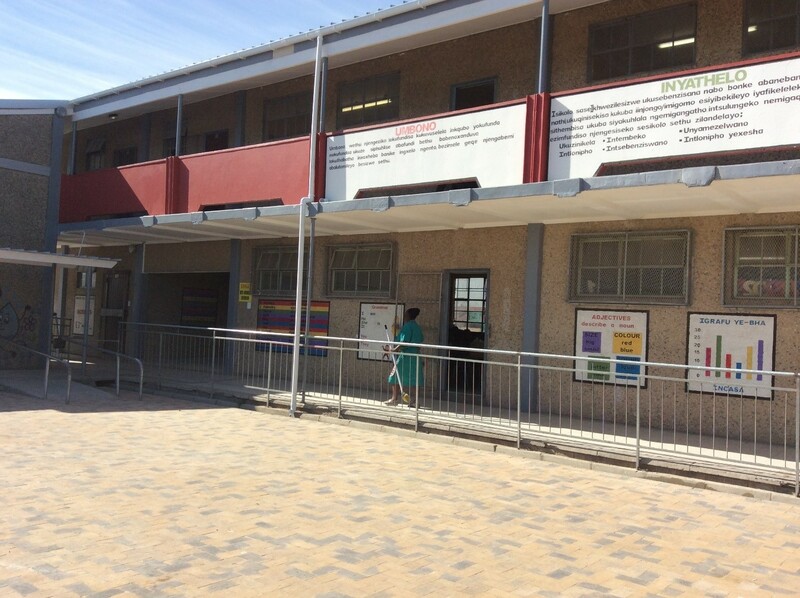 Generally, like in most Khayelitsha schools, the class sizes are large, ranging from 40 - 47 learners. 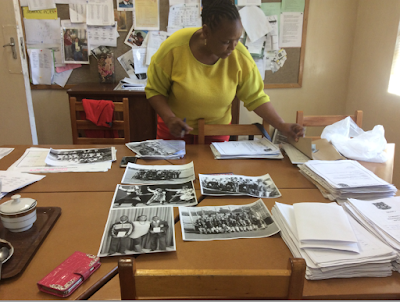 The principal Mrs Mayeye is a very pleasant person who is extremely proud of her school and its achievements. As we talked in her office and I told her of some of the exciting things that are happening in technology around the world in classrooms, such as the ever-popular mystery Skype sessions, she grew very excited and begged me to come back once Internet has been installed at their school, to get them involved in these opportunities. I found that teachers at the school had developed a tablet timetable from Grade R to Grade 3 and and they were well into using the tablets routinely every week. They mainly used an offline program called Talking Stories on the tablet, for reading lessons; but they were very keen to hear more about how they could use the other apps in their lessons when I presented the coaching session after school. As I watched the teachers using the tablets, whilst observing them in their classrooms, I had the idea of writing a post about using the tablet offline for reading in a Foundation Phase classroom. Some teachers use the tablets for group reading sessions while others use them for whole-class reading. The reading app installed on the tablets, Talking Stories, has been installed in such a way that it can be used offline; and since there is no WIFI in the classrooms at the school, this is a great advantage. Although the teachers enjoyed this app with its English stories they really longed to also have isiXhosa stories on their devices especially as Grade 1-3 learners learn in their mother tongue. Since the classes are so big the learners have to use the tablets in pairs. The teacher reads to the whole class, modeling fluency, thinking processes, and the type of expressive reading necessary for comprehension and engagement. The read aloud often builds upon the learners' existing knowledge and skills, but it also serves as a useful way to introduce new types of text and reading strategies. 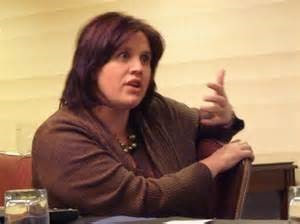 In the read aloud the teacher often thinks out loud so that students can learn they techniques they use to make connections, visualize stories, make inferences, use fix-up strategies when they don't understand what they read, determine unknown words, and formulate questions about the text. It really helps when learners can read to someone. A reading partner, sometimes called a reading buddy, is a good choice in the classroom. The learners can read to one another and help one another. Shared Reading is an interactive reading experience that occurs when all the learners join in or share the reading of a big book or other enlarged text while guided and supported by a teacher or other experienced reader. Students observe an expert reading the text with fluency and expression. The text must be large enough for all the students to see clearly, so they can share in the reading of the text. I noticed that the teachers had the BIG Book versions of the Talking Stories which would enable shared reading to proceed smoothly. (If one didn’t have a Big Book available a data projector projecting on to a screen could work,) The Department of Education developed an excellent booklet called Teaching Reading in the Early Grades some years ago. It explains the process of shared reading really well. It can be accessed at https://goo.gl/oXKP4V . Group-guided reading is an instructional approach that involves a teacher working with a small group of learners who demonstrate similar reading behaviours and can all read similar levels of texts. (The challenge to a teachers is always what to do with the rest of the class while group-guided reading is taking place.) Very often, the teacher will begin a session by introducing the text and modeling a particular strategy. The teacher and student engage in meaningful conversations about what they are reading, and the teacher can build on their use of different reading strategies over time. This time of classroom reading instruction is essential to promoting essential reading skills. Independent reading gives learners the opportunity to practice the strategies they’ve learned through group-guided reading, shared reading, and teacher read alouds. In independent reading time the learners choose their own stories. There are said to be five components to a successful reading lesson, and teachers need to incorporate these into their lessons; namely phonemic awareness, word recognition of both sight words and phonics, comprehension, vocabulary and fluency. Teachers will use various activities during their reading lessons to develop these components. For example, to develop comprehension teachers might use 'retelling'. The learners retell the story in different ways to a partner, a group or the teacher. 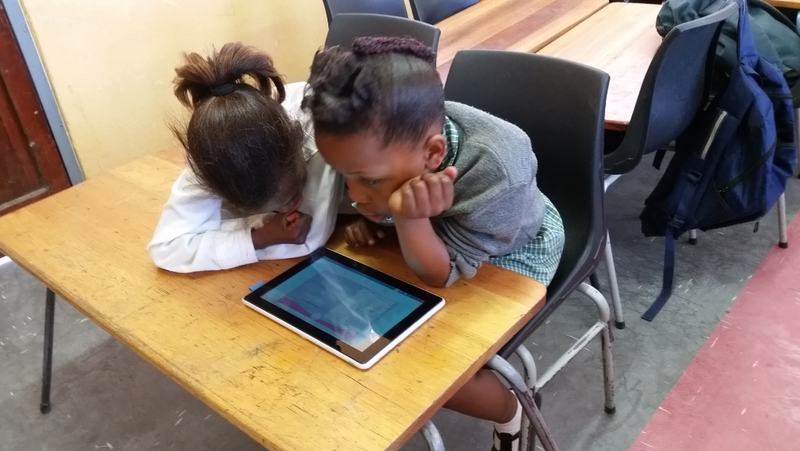 When the teachers mentioned that they would dearly love digital reading material in Isixhosa, I immediately thought of the African storybook project http://www.africanstorybook.org/ developed right here in South Africa for Grade 1-3 learners. b) Transfer the stories via Bluetooth to another Windows device. Tablets are an attractive device to use in the classroom because they are halfway between laptops and mobile phones. This means they are big enough to work on for a period of time, on a desk, in a classroom. Their touch screen capability allows them to be used with a stylus which is similar to using a pen or pencil. The use of touch-screen tablets can bring many advantages to the classroom. One such advantage is that learners become more enthusiastic in their lessons. The big challenge to teachers is to consider not only the apps and the technical side of the tablet devices, but to be aware of pedagogical considerations as well. I was privileged to visit five schools in one of the poorest areas of Cape Town, Khayelitsha, as part of this visitation programme. In this post I’ll refer briefly to my visit to Isikhokelo Primary School in Khyalitsha. In Khayelitsha, generally, the class sizes range from 40 - 47 learners. I found this visit very inspiring, as the teachers who were trained had shared what they had learnt with the other Foundation Phase teachers after the training, and the school had drawn up a timetable and a plan for using the devices. 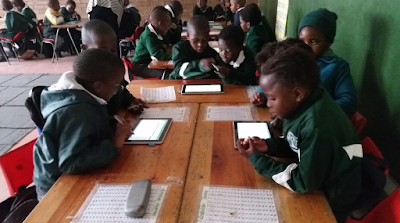 When I visited some of the classes I could see that both the teachers and learners were feeling comfortable using the tablets. One of the apps I noticed them using when I visited their classes was the Paint app. This post will focus on some ideas for using a painting app such as Paint in the classroom. 10 ideas for using Paint in a Foundation Phase class Microsoft Paint doesn’t appear in the alphabetical list of apps on a Windows tablet, but it shows up when one types 'Paint' into the search bar. This is a very useful app, especially in Foundation Phase, as it can also be used as a whiteboard with colour pens and an eraser. The learners can identify different colours, shades of colours and sizes of pens. They can develop their fine motor skills when they use a stylus with this app. 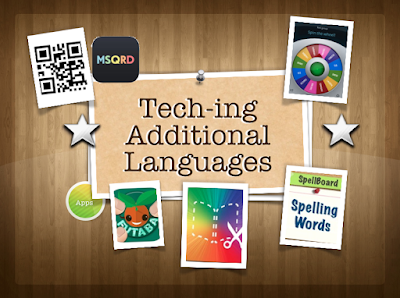 The nature of this app taps into a learner's creativity. The Paint app can be used as a whiteboard in a lesson. Learners can manipulate different shapes. Learners can use a text tool to type words. The work can be saved if desired. Paint can be used in a number of different ways in a Foundation Phase classroom. Here are ten ideas. In reading lessons learners can paint a favourite scene from the story just read. They can describe what they have drawn, and why it was their favourite part of the story. Learners can illustrate sentences from the story. The teacher could highlight a sentence and the learners draw what they visualise. Learners can redraw a picture that appears in the story. Learners can also complete an unfinished story in the form of a picture. In phonics lessons learners can listen for the beginning sound of a word spoken by the teacher and they can write it in Paint. The teacher could also call out some of the phonics they have learned and the learners could practise writing the sounds on their tablet devices. Paint is useful in Life Skills lessons. For example, when learning about dental hygiene, learners can draw a picture of a beautiful smile that demonstrates healthy teeth. Learners can easily draw diagrams and label them. For example they could draw a body and label the body parts when learning about the body. In Maths lessons that involve using shapes, Paint provides a great selection of shapes that can be manipulated and coloured in. In Maths lessons Paint can also be used for writing the Maths sum and working out the answer by means of a sketch. The learners could be asked to explain their thinking to a partner. Paint can be used in an Art lesson especially when art resources are limited at a school. Draw a picture showing a new end to a story. The learners will create their own story ending after listening to a story. Locate an interesting story for the class. You will either read the story to the class or tell them the story, but remember to leave out the ending. Read or tell the story to the class modelling as much reading expression as possible. Do not mention the end of the story. Discuss possible story endings with the class. Tell the learners they will draw a picture showing their own ending to the story. Introduce the Paint app to the learners if they have not used it before. Talk about the paintbrush sizes, the colour palette, the paint pot for colouring in, and the eraser for rubbing out mistakes. Let the learners use the stylus when using Paint to have better fine motor control. The stylus in this instance is their paintbrush. Walk around and help those learners who require assistance. Be quick to compliment the learners on their drawings. Let the learners use the A icon in Paint to type their name. They could also type their own sentence about the picture they have drawn. Let the learners discuss their story endings with one another. The image can be saved to illustrate how to save, but this will need to be erased after a while to save space on the tablet. Whatever tablet you use in your classroom, make sure that you have a similar app to Microsoft Paint that can be used as a whiteboard as well as an art programme. You'll be surprised how often you'll use it in your lessons. Is your school actively using technology to improve teaching and learning? Is your school using (or considering deploying) Office 365 for use in school administration and the classroom? Are your school leaders using technology to assist with school transformation? Would your school like technical support and professional development from Microsoft to make better use of your Microsoft technology for education? If you have answered “yes” to these questions, consider signing your school up to be part of the Microsoft Schools Program by Friday 28 October 2016. When we receive and approve your application to be a Microsoft School – you will receive Microsoft School status for demonstrating commitment to embracing technology to transform education and improve learning outcomes for students. Please apply to be part of the Microsoft Schools Program by completing the application form here by Friday 28 October 2016. 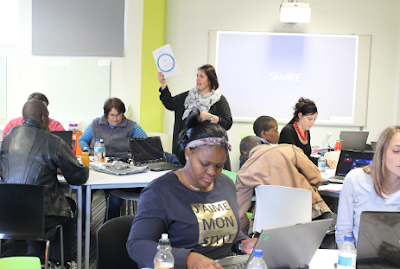 Whilst she is no longer a school teacher, as the head of ICTISE (ICT Innovation in School Education), a unit of the University of the Free State, Sarietjie continues to encourage and mentor teachers to use technology in the classroom. 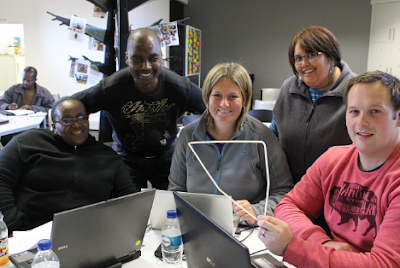 One of the ways that Sarietjie acheives this is by running the Microsoft Peer Coaching Program which is designed to train teacher leaders to serve as peer coaches for their colleagues. 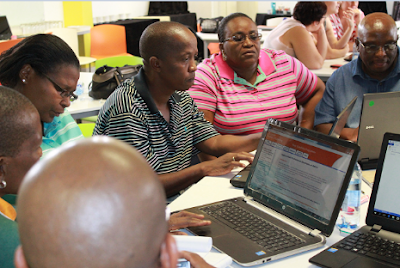 Sarijetjie feels that peer coaching plays a vital role in getting teachers excited about technology and that it can have a positive effect on university faculty too. 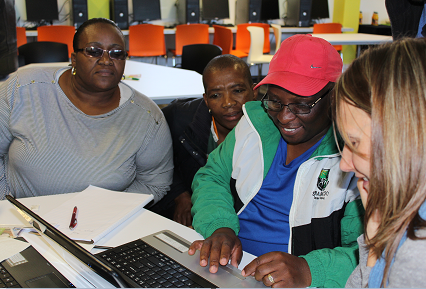 At the time of being interviewed Saarietjie said, “We’re in our sixth round of the Peer Coaching course now in the Free State, and I have also done it with the different faculties in the University of the Free State”. Peer Coaching can be offered as a face-to-face course, comprising eight workshops over a nine month period or as a blended course with online interaction and activities – depending on the needs of the participating teachers. Both versions of the course require the principals of participating schools to attend some sessions to see what the program is about. 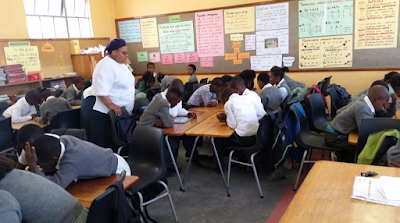 Sarietjie says, “In our last group we had 24 schools attending, and 21 of the principals attended session one. The moment a principal attends session one we know that this will be a principal who will support the teacher who attends the eight sessions." As someone who continually encourages and inspires others to use technology in new and exciting ways Sarietjie finds it important to stay up to date with new tools and trends and to also be inspired by others. “Social media is the river that fills my dam enabling me to go and give to others,” she says. The Internet is currently full of posts about using Microsoft products effectively in the classroom. Here are a number of them from this past week. Free Basics by Facebook partners with mobile operators in different countries to provide people with access to useful services on their mobile phones in areas where internet access may be less affordable. 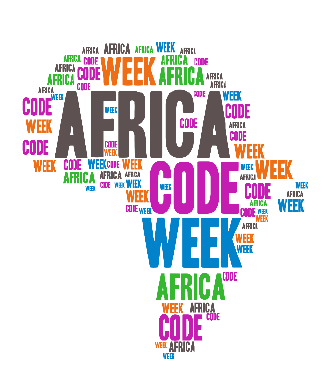 In South Africa, Cell C has thus far partnered with Free Basics and has a number of websites available for free without data charges (zero-rated), and include content such as the news, employment, health, education and local information. By introducing people to the benefits of the internet through these websites, Free Basics hope to bring more people online and help improve their lives. Are you a Cell C subscriber? If you are why don’t you try Free Basics? What kind of content is available? Intel’s She will Connect programme is part of the zero-rated offering which aims to provide digital literacy to women and girls in rural areas. This programme offers women an opportunity to learn about digital safety, thinking through online profiles, planning online interactions and ways to marketing small businesses online. Other sites include Bing Search, Wikipedia, Money Matters...and the list keeps growing.